Why are people developing and publishing games online without charging money? What's the incentive of sharing games one designs themselves for free online such as itch.io? I see people doing this and I don't understand. It's okay to value a thing and find it fulfilling even if you don't get paid for it. Instead, for me at least, I do it for the love of the challenge of gamedev itself, and for the love of play. By sharing this game freely, it's gotten more people playing & enjoying & sharing it than I expect it would have even at a miniscule price, which for me (since I have a full-time game development job to support my livelihood separate from these hobby games) is a worthwhile trade. ...but my point is that these aren't the only things that can make it satisfying and worthwhile. Sharing content for free might not enrich my bank account, but I believe/hope, in some small way, it enriches the world. Making money through advertising. A lot of game portals use advertisement. On some portals, game creators get a cut of the revenue of the advertisement which appears next to their game. You can also integrate ads directly into your game. Or someone might actually pay you to create a game which advertises their product (anyone remember Moorhuhn, that advertisement game for Johnny Walkers whiskey which broke the Internet in 2000? Or maybe it was just a German phenomenon...). Grow first, think about monetization later. Get as many players as you can for now, and when they are all addicted to your game, look for a way to make them pay to keep playing. Making a name for yourself. When you created that free web game everyone knows and a few years later you release a new game for $19.99 on Steam, you can market it as "The new game from that guy who created that awesomely addictive web game in 2019". Anyone who played your previous game will get curious about whether you were able to build on your success or not. In today's game market, it's all about exposure. A developer who already has a reputation for making a few good games has a much better chance to make it than someone who is completely unknown. Building a portfolio. When you are looking for a job in the game development industry, people will want to know if you have experience. A great way to convince people that you know your craft is to point them to a few games you created. When your games are free, they can play them right away. Practicing your skills and collecting feedback. 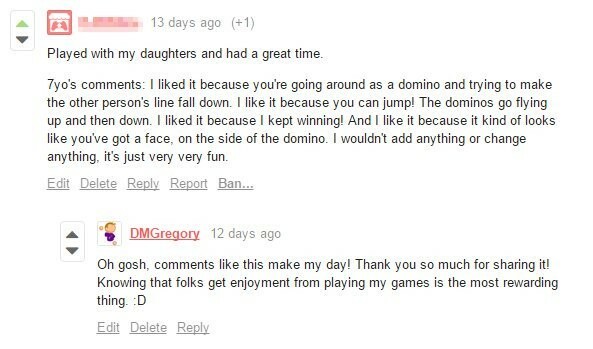 The only way to find out if your game design is good or bad is to let people play it and listen to their feedback. 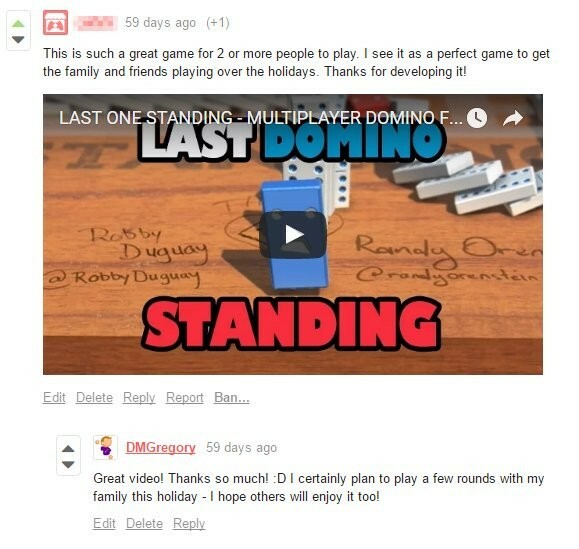 The more people play it, the more feedback you will get. Feedback also gets more honest for more popular games. You can read people publicly discussing your game who are unaware that you will read them. This allows you as a game designer to learn what works, what doesn't work and thus improve your design skills. The most nerve-wracking part of game development is the release. But it becomes a much less serious endeavour when there is no money involved. Releasing your "practice game" for free is a valuable experience which will help you to become a bit less afraid of the release of your first "real game". You can even use free web games as a medium for testing a new game idea. You create a simple prototype, upload it for free, see how people react to it and when people like it you use the game idea for a new full-price game with proper production values. Doing it for the art. Some people want to make games as a form of self-expression without commercial interests. Maybe you have something to say through your game. Maybe you just want to make people happy, and that's reward enough. The chance to make enough of a profit to actually justify the added effort and overhead of billing is not big enough. Most indie games don't make money in a quantity worth it, and the billing part is not fun, while making a game is. The line between amateur and commercial can only be crossed once, forever. For a free game, I can take it down, stop developing and supporting it, etc. at any time I feel like it. No obligations. Once people have paid for it, they are customers and have rights (moral and/or legal). Along the same line, I release many games in a half-finished state, basically once it is playable. They don't have the quality that I would expect from a finished, commercial game. For free, that is ok with me. For payment, I would feel myself to be a cheat. Money later - I make games for fun, my fun. Money is an afterthought. That is why I put "free" in quotation marks above. Some of my games have ways to pay me, usually optional, e.g. donations or cosmetic DLCs or other premium features. But the gameplay itself I keep free because I don't like to play bait & switch with my players. These are my personal reasons, and other people have others. Note also that "free" is not always entirely free. Some games have advertisement, or product-placement tie-ins, or follow a shareware model, or follow one of the many other routes to profit. Labor of love - Some developers make games purely for the enjoyment of creating them and want to share their results with others. Building a player base - In some instances, a developer may choose to release a game for free as an initial step toward building up a player base for a later game. In particular, crowd funding efforts are often more successful when they launch with a strong first day; giving a game away one way to build that day one audience. Building a portfolio - One of the best ways to demonstrate that you can make games is to demonstrate the games you've made. Some people start with releasing small free games to build personal experience & reputation. Reducing work - Unfortunately, as soon as money becomes in involved, some things become more complicated. User's expectations for support increase. There's often more paperwork & book keeping to deal with taxes, income, etc. Some developers just want to focus on development, not business. It's only free today - Not all games stay free. Some platforms give developers the option of changing the price. Some developers may release for free initially (for instance during early access) and charge for it at a later date. I make not only games, also apps for free. I do it, because I enjoy it. None of my products has even ads included. Why? Because I do not like ads. I do not want to give away the screen space and every app looks better if there are no shiny blinkyblinky ads on the screen that catch your eye. I love coding. I love apps. And I hate ads. My apps do not contain ads, my main focus is not "making money". I don't care. Honestly. I write apps because I love to write apps. I already have a (well paid) fulltime developer job and the things that I do at home, I do for me, for friends (but they all are published globally through play store) because I want to have that one specific feature, that one app that does exactly what I want. I am always happy when I receive ratings on my apps or when someone drops me a mail. That's enough for my personal wellbeing. That's why I do it. I can't think of a better reason. Cheers! I'm a fan of some rather niche and/or oldschool genres, as well as quite complex mechanics in general. Finding games that scratch the right itch has become difficult. Of a handful of promising projects, most get canceled or turn out mediocre. There's also a general trend to simplify mechanics, presumably to appeal to more casual audiences or work with the more limited input options of consoles. Compare the original Deus Ex or Baldur's Gate to modern RPGs, for example. My team's current project has been in the making for several years (it's complex), and I'm fairly certain that it will only appeal to a (relatively) niche audience. The only way I'd expect it to be commercially successful would be with a "big name" license like WH40k or Battletech, which we lack the funds for. We're making the game because we think someone should, because we want this game to exist, and to share it with the people who appreciate the genre. And we'd rather make this game than something that makes more money but doesn't interest us. You don't make earn money without some planning, marketing, managing. All that costs time, which is a limited resource. Any use of your time has to be weighed against what else you could be doing. Now, I can justify spending time and money on creating something that has value to me (a great game), but making money selling games only makes sense if you can make more this way than you otherwise would. If you're good at (and like doing) more than one thing, why not pick the one that pays best as your job and do everything else as a hobby? Some supporters of the free software and/or open source movements make games and release them for free purely to support those movements and increase the pool of free/open source games. For example, the Minecraft clone Minetest. Personally I am not one of these people, but I know a handful of people who are. Some people release their games for free because they want other people to benefit from those games somehow, e.g. by being able to learn programming techniques from them, or simply so they can enjoy them. I'm actually a moderator on two programmable game console forums where every person who contributes a game does so free of charge. It's part of the culture - the games exist purely for fun and education, not for profit. In addition to the non-monetary benefits covered in other answers, there can be significant and immediate monetary benefits to releasing your game for free and then asking for voluntary payment under a "pay-what-you-want" model (either directly or indirectly with a subscription using a tipping service). As many developers of mobile games have figured out, a small number of whales account for a large portion of income. Thus, impeding any potential whale from discovering your game (say because of risk-aversion) may lose you more money than you gain from minimum-price sales. You may think this is limited to mobile games with predatory monetization, but I have seen similar whale behaviour in video game crowdfunding campaigns and in gaming-related content like livestreams. I also know of some developers in... "niche" fields you do not speak about in pleasant company who release games for free and enjoy a respectable income in the form of tips and are doing better than their peers making games under a traditional fixed-price scheme. It should be noted that none of these cases goes to the extreme distribution seen by whales in mobile games nor have they undergone any rigorous analysis so such anecdotes should be taken with a grain of salt. Last minute sales to fill capacity (ex. in a theatre). For software, capacity isn't really a thing, but the idea is to generate some amount of sales when you would normally get none. This is the model used by various bundle sites: long after release some amount of money can be extracted by having customers pay something. Obviously, this is different from a game released for free from the get-go, but as other answers have noted for commercially unviable games, some amount of money can be extracted this way without having to go through market research and pricing analysis and other wonderful such things you might not care to do (or even dislike). When customers have a personal relationship with the business owner. If you look less like a faceless company and more like a person people want to cheer on and succeed, it turns out people are more likely to give you money. If it feels like you care about them, listen to them, and address their concerns, people are more likely to give you tips. Retrospectively by looking at your question, there is an implied connection between spending time on a game and monetary returns. The same notion can apply to the consumer - there is the friction of parting your money to purchase a game. If you're new to the scene and you don't have much of a following it becomes hard to gain an audience. If the game is free, then you will attract more customers. The advice for would-be game devs is to start small and ship. Jumping through the hoops to actually sell a game rather than just distributing it takes time and therefore money. Games like this just don't sell anyway. If all you can hope for is experience and possibly feedback to make better, bigger games in the future, then free, friction-free distribution is exactly what you want. And exposure, if you are incredibly lucky and your basic games really catch on. People who release free games are are either educated or uneducated on the topic of game development business or selling their game as a product. Uneducated: Don't understand the value of their own product yet, don't know how to advertise it or who to advertise it to. Educated: Understand the potential value, know their niche and release a free demo. The above is triggered by the low barrier of personal costs and time of developing and releasing that game engines like Unreal, Unity, GameMaker, etc. have enabled. The cost and time is not perceived as something important by a large portion of uneducated younger mass of game makers who accesses these tooling. Newcomers can afford to release free games or at least they are being fooled by the current market and culture that they can. Do “Results-Oriented Work Environments” work? What sort of GDC pass (if any) is best for a cash-strapped indie? Set up indie game studio (UK) - how? Should independent game developers target older hardware? How is Crytek going to make profit from making their tools free?